This conservation resource was created by Jessica Cunningham; Casey Haney; Nicholas Johnstone; Amy Mudan. It is shared under a CC-BY 4.0 International License. Cotton is the most widespread, profitable non-food crop in the world . 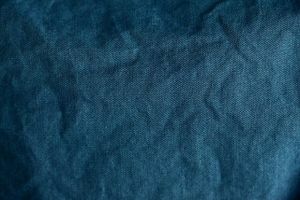 Over the past century and a half Egyptian cotton has earned a global reputation as being of the highest lint quality when compared to other cotton products grown elsewhere across the world . Today, cotton plays a key role in Egyptian society by providing job opportunities and trad-able goods to support the economy. From the customers who purchase cotton materials, to those who transport the goods, as well as those who grow and harvest the crop itself. The entire cotton farming process employs more than 250 million people worldwide and accounts for almost 7% of all labour in developing countries  . Although cotton plays a key role in Egypt’s economy, that in no means does it suggest that the current cotton farming practices are not flawed. The current cotton production methods in Egypt are environmentally unsustainable. Cotton is a very important natural fiber used in many textile products globally . As of 2006 cotton is about 40% of textile production. Muhammad Ali. By Auguste Couder via Wikimedia Commons. Public Domain. Egypt first began to industrialize in the 1800s while under the rule of Muhammad Ali . In an attempt to improve the domestic industry and make a profit, Ali planned to buy cotton at low prices and re-sell it at higher prices . His idea grew and quickly created a monopoly type system which also included other agricultural products  Ali did this because he wanted a quick solution to raise revenue which would result in an increase in living standards for all the citizens of Egypt. However, this actually resulted in both the urban and the rural workers’ pay to decline even further than it already was . 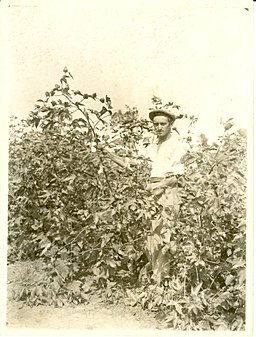 Since the cotton farmers were to sell their cotton at low prices it created an incentive to reduce their cotton output. However, Ali needed a high output in order to up-sell it and make a profit. Therefore, he invested money on irrigation and transportation infrastructure so that the farmers would continue to produce cotton. 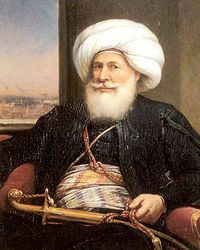 With the help of Ali’s contributions, new cotton farming technology and improvements had been made, including the commercial production of cotton introduced by Ali himself in 1822 . By the 1830s, Egypt’s modern core consisted of cotton spinning and weaving. Soon after, Egypt was tied for the 5th highest spindle/ population ratio in the world . Although cotton production provided the majority of employment throughout the 1800s, the low wages for farmers and unsustainable systems put in place ultimately undermine the success of the industry’s future productions. Egypt’s tax farming system was introduced in the mid-1800s, which allowed land to be leased out to and cultivated by peasants, in exchange for rent . At this time rent consisted of either cash or in some cases a labour service provided by the peasant to the landowner . Landholders quickly began to realize the wealth associated with the property rights and began to sell them. The tax farming system also allowed for the landowner to take up to 10% of the income generated by the overall crop production that took place on their land . The newly realized wealth through trading land was increasingly favourable for tax farmers, who soon found themselves alongside the ranks of wealthier merchants, bankers and state officials . On the other hand, the peasant landholders found themselves becoming tenants who were bound to their landowners. Such changes in the ownership of land coincided with an increase in demand for agricultural goods . In Egypt the cultivation of cotton continued to be dominated by small land holding peasants . Where the wealthier land owners relied on the income of the tenant, not just through rent but also their entitlement of 10% in overall crop revenue . Numerous organisational and sustainability problems began to appear due to lack of knowledge and experience. The peasant farmers were put under extreme pressure to constantly produce using the cheapest materials possible for their landowners demanded high quantities of cotton for the lowest price  This demand created a mentality of fast cash where increasing the product available would also increase financial opportunities. Thus, a way to save money is by using the cheapest technologies which unfortunately happen to not be very eco-friendly methods. Egyptian cotton farming. By Mennonite Church USA Archives via Wikimedia Commons. No reuse restrictions. Cotton production is divided up into two main stages, both of which have multiple impacts the environment. During the first stage, the growing phase which includes planting and harvesting, cotton farming causes leaching of pesticides which runoff into the groundwater and in some cases accumulates in the soil or food chains . Approximately 24% of the worlds insecticide market is used for cotton farming . Nitrogen fertilizer is added to cotton fields with plants only taking up part of it . The other part, an estimated 20%, of N-fertilizer is denitrification in to N2 and leaves the soils through the atmosphere, groundwater or by surface runoff . When large bodies of water recieve this excess of concentrated nitrogen it increases algae growth which in turn affects the fish and marine habitats . Excess nitrogen also increases the cost of purifying the local drinking water . It has been found that about ⅕ of the global water footprint is a result of pollution from cotton farming . With cotton farming accounting for 2.6 % of the global water usage . Next is the processing phase where the collected cotton can be transported either locally or internationally to factories where the cotton may be turned into profitable items, such as clothing. Cotton uses an enormous amount of water, however, about 44% of the water used for cotton is not to benefit the domestic market but instead is used for exports . Egypt’s cotton farming industry has brought the careless and indiscriminate use of synthetic pesticides due to the desire to kill the problematic Egyptian Cotton Leafworm . The Egyptian cotton leafworm, or Spodoptera littoralis, is a pest of the Egyptian cotton crop that creates serious problems. The reason that this pest is such a problem starts with the fact that cotton has a very unique position in the Egyptian economy. Egypt’s central cash crop is cotton and forms an important part of it’s agricultural exports in both raw and processed forms  Egyptian cotton occupies a unique and important place in the world market because it is a very high quality, long staple fibre. In the 1970’s, raw cotton production accounted for only 5.4% of the countries total gross domestic product, which may seem insignificant, but this is in no way the case. When you look closer, you see that the crop constitutes 46.2% of the country's total exports and is equivalent to 75.6 % of the countries total agricultural exports . This is however a reduction from reports, but cotton is still a very large part of Egyptian exports and is foreseen to continue to be in the future . Largely due to the fact that Egypt is a developing country, it has a chronic balance of payments deficit. The Balance of payments is the record of all international financial transactions made by a country's residents. A country's balance of payments expresses whether it saves enough to pay for its imports and also reveals whether the country produces enough economic output to pay for its growth. As Egypt has a lasting balance of payments deficit, it means that such a dependable export product is of a critical economic importance to the country as a whole . As Clapham states that “losses from the Egyptian Cotton Leafworm are measured in millions of Egyptian pounds (kE) per year”, you are able see how this pest is of great concern and how eradication efforts have led to the use of harmful pesticides as an effective method. There are also other pests to the crop, but they are not of significant concern when compared to the destructive power of the Egyptian cotton Leafworm. The use of these pesticides has a malicious effect on the environment . The usage of some pesticides used in Egypt cotton farming have unfortunate side effects for many non-target organisms such as natural predators and pollinators. A study was done to see how effective these pesticides were compared to the effects they had on non-target species. Rates of reduction in the target pests pink bollworm, Pectinophora gossypiella, and the Egyptian Cotton Leaf Worm Spodoptera littoralis populations, , ranged between 63.2-72.5 and 61.9-74.8% in 2013 and 2014 . This can be seen as an average of a 68% rate of reduction in these target pests. Rates of reduction on the non-target species Aphis gossypii, Bemisia tabaci, and Tetranychus Urticae Koch ranged between 35.6-83.3 and 50.3-83.0% in 2013 and 2014, while the reduction rate was 79.2-96.5 and 65.2-91.8% in the populations of the predatory species coccinellids, Chrysoperla carnea, and spiders in 2013 and 2014 . This can be seen as an average of 60 – 80% reduction in non-target species. This study provides evidence that the pesticides that are being used to reduce the target species are reducing the populations of non-target species in the same area by about the same amount. These non-target organisms are valuable to agriculture and the environment and their value is largely underestimated . Egypt’s cotton production has been growing for the past few decades and is ranked as one of the best cotton products in the world because of its long fibres which make it strong and soft . However, there has been a steady decline in the production of cotton in Egypt since 1994, when the Egyptian government discontinued their subsidies(citation). Resulting in a decrease of farmers continuing to farm cotton . Cotton agricultural land in Egypt has been reduced by nearly 80% . Without financial help from the government the new sustainable standards used for cotton farming became too expensive to uphold. This resulted in many farmers to turn to the quickest and cheapest technologies while still producing large quantities of cotton that could be used to make a profit. As of 2017, Egypt announced that they are planning on doubling their production of cotton, all for export to increase their national economy . 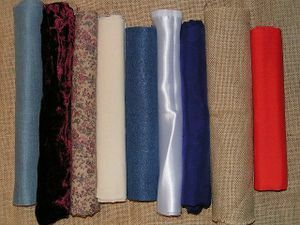 The Egyption textile and spinning industry contributes to about 26.4% of the total industrial production . This will result in about 7 billion U.S. dollars in annual exports . The dry and humid climate of Egypt is not suitable for cotton farming because there are large amounts of water lost due to evaporation and very little rainfall throughout the year leading to very limited sources of water supplies. Egypt’s currently facing its worst economic crisis due to the decline in the production of cotton ). 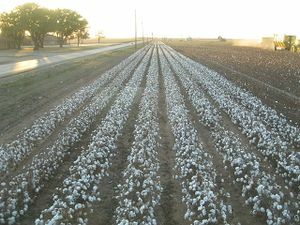 Cotton farming requires considerable quantities of water. Egypt consumes the second most amount of water for cotton farming when compared to other cotton farming countries. 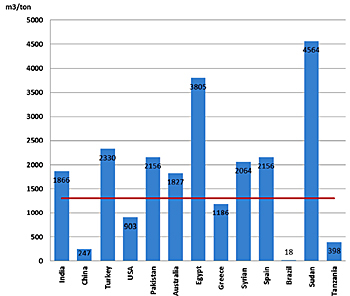 Egypt consumed 3805m3/ton, which is at least a thousand m3/ton more than the third highest water consumer in the world. The global average of water used for cotton farming is about 1300m3/ton, this means that Egypt is currently using over twice as much water to farm cotton compared to other countries. A key factor influencing the recent decline in cotton farming has been due to the difficulties farmers have faced with the Government of Egypt. The Egyptian government delays the announcement of ‘indicative reference prices’ until the fall period. Government indicative prices for cotton often exceed international prices and are intended to encourage expanded local cultivation . However, the fall time announcement date by the Government of Egypt disrupts the ability of cotton farmers to strategically plant crops to maximize profits. Therefore, many Egyptian farmers have been losing money on cotton crops and switching to other more financially beneficial crops. The water footprint in Egypt is greater than the global average shown as the red line. Cotton farmers rely on their harvest to financially support themselves and their families. Cotton farmers are consistently faced with the lack of perceived financial benefits in comparison to their current practices. A potential problem when implementing a new water irrigation system is the amount of time and money it would cost the farmers to install and purchase new technologies. If a farmer has to dig up land to replace a currently working but unsustainable irrigation system, the short term effects are money and crop loss due to the destruction or inability to plant crops. In addition the farmers then have to pay for the new system which results in even more money lost to replace something that is not physically broken. Cotton farming in Egypt relies heavily on a wasteful and out of date irrigation system put in place by Muhammad Ali back in the 1800s . A possible solution is to re-adjust the old system and put in place a new irrigation system which would reduce the amount of wasted water . The European Commission emphasizes ‘technological innovation in the field of water’ given that water efficiency will be an increasingly important factor for competitiveness . Here the goal is to use water as efficiently as possible by improving the knowledge between the farmer and the environment as well as adopting to updated equipment and innovations . Although a possible solution seems as simple as a water irrigation system there are several important factors that prevent this seemingly easy solution from becoming a reality. In an attempt to increase the water storage capacity of soil under agricultural land use, a number of problems arise. As stated above, greater water-use efficiency depends on better agricultural practices alongside sustainable methods and technology. Yet companies often forget to mention the risks and possible consequences of improper usage or failure of water irrigation systems . Improperly managed hi-tech irrigation systems can be wasteful and unproductive when incorrectly managed ‘thus decreasing the economic water productivity index and the overall sustainability’. In Egypt, there is a general consensus between cotton farmers who generally perceive irrigation efficiency as maximising their revenue and profits rather than conserving water. Instead many of the Egyptian cotton farmers manage labour and other inputs to further increase their economic gains . These decisions are usually only subjective judgements, which are based on the farmers practical experiences and observations . Assuming irrigation are applied to meet the crops’ water needs, Micro-irrigation has the potential to achieve the ‘highest uniformity in water applied to each plant’ . However, there are numerous applications that could jeopardise the efficiency of such a system including but not limited to, inadequate maintenance, low inlet pressure or pressure fluctuations, emitter clogging and inadequate system design . There are some management practices that could improve productivity in rain-fed areas in Egypt . Farmers that performed micro catchment water harvesting technique can apply supplementary irrigation to increase productivity of their cultivated crops . For example, the increase of 30 mm as supplementary irrigation increased the yield of wheat by 30% in North Sinai . Another suggested solution is using genetically modified seed technology (Fao, 2004). In China, the income of farmers doubled after adopting gmos and pesticide use declined by 25 percent (pray and others 2001, 2002). In an assessment of the effects of gmos, Edge and others (2001) concluded there are no downsides beside the technology fee. A solution Egypt is currently pursuing is saving its historic crop by only using the highest quality seeds . This has resulted in the area of cotton rising by approximately 20 percent . An article from the Agriculture department of the Government of Canada  talks about how biopesticides can be used in place of chemical pesticides to control pesky insects, weeds, and plant diseases. Biopesticides can be placed into 3 different categories.1) Microbial organisms such as bacteria, fungi and viruses; 2) Plant substances produced by genetically modified plants and/or plant incorporated protectant;. and finally 3) Naturally occuring substances such us pheromones and allomone  The use of these biopesticides have been shown to have many advantages over the widely used synthetic competitors if produced, formulated, and applied in the proper ways. These chemical pesticide alternatives could prove to be very environmentally beneficial if applied to cotton cultivation in Egypt as a means to eradicate the troublesome Egyptian cotton leafworm ‘Spodoptera littoralis’. This is because the use of biopesticides have a much lower toxicity rate for non-target organisms, again, if used in the proper way . Inter-cropping in general produces a higher yield of mixed crops per hectare than individually grown crops . Crop rotation has been seen to be a highly effective solution to sustain soil and water resources . Research conducted by Khalifa et al. (2004) found that the yield of barley grown after pea or lentil increased by 113 and 104%. Initially, farmers stopped producing cotton because the production costs were higher than the international prices . Another issue that Egypt faces is that importers are still use to a low supply of Egyptian cotton and have made plans to buy from other international suppliers . However, there is more incentive for farmers to plant cotton as the price of cotton is internationally rising . To conclude, Egypt’s cotton production has been declining since 1994 as it became more expensive to produce as a result of discontinued subsidies. In addition, the dry climate and low precipitation of Egypt ensued a low water supply. This is a significant issue as producing cotton requires a large quantity of water. Farmers perceive cotton farming to be expensive, while lacking financial benefits. The government often delays sharing information of indicative prices coupled with it often being overestimated. Thus, causing cotton to be perceived as a low-profit crop by farmers. To solve these issues, a new irrigation system funded by the government should be put into place. This would maximize water usage and minimize any costs for farmers. To add, farmers should be educated on the new equipment and technology. Actions to be taken in order to maximize Egypt’s cotton output are to invest in new technology and education for farmers. The basic issue that farmers are facing is that cotton is not profitable for them. In order to fix this issue, the government should make it cheaper for farmers to produce cotton, which includes subsidizing new technology to increase water-use efficiency. To go along with the new technology it should be required that farmers receive proper training on how to use it, maximizing productivity. By subsidizing new technology for farmers, it will increase their incentive to grow cotton. Furthermore, the new irrigation and biological technologies will make producing cotton more profitable for farmers and thus Egypt. Although new developments in technological procedures for hybrid power systems to improve agricultural water management have been invented, these practices have been ill adopted in Egypt and should be considered for the future. ↑ 18.018.1 Biswas, A. (1993) Land Resources for Sustainable Agricultural Development in Egypt. Vol. 22, No. 8. pages 556-560. Published by: Springer on behalf of Royal Swedish Academy of Sciences.